Welcome to Make It Monday with Kraft Outlet. Use this week's "Favorite Color with Kraft" to inspire you to create your project and then link it up at the bottom of this post before 6:00 p.m. (Eastern Time) on Sunday March 24, 2013. Remember your projects MUST include the use of Kraft cardstock and/or items that can be purchased at Kraft Outlet! Also, all of our followers who participant in our challenges this month have a chance to be featured on our "Feature Me Fridays" posts as well as be entered to win a $15.00 Kraft Outlet Store Voucher! The more challenges you enter this month, the more chances you have to win! Jan loves white with kraft the best, but since we did that combo a couple of weeks ago, she chose red as the next favorite with kraft. Jan used a couple of themes here, both numbers and harlequin shapes, to tie things together. She also included the inside, as this is a card meant for someone who needs to be reminded she is so beautiful. The humble beginning of this card is the always useful Kraft Note Card. Adhered to that is some design paper, stamped with harlequin shapes. The "beautiful" Lille Tag was distressed, inked and threaded with Black Burlap Ribbon. Another harlequin shape was added with pearls, and a Custom Fastener with another number was attached atop, bowed with Natural Hemp Cord. The edges were inked and distressed. Jan made a very simple inside, with more of the harlequin stamp, another Lille Tag, and one more numbered Custom Fastener. Stop by Jan's blog, chai tea 'n me, and say hello !! For today's "Favorite Color with Kraft" challenge, The Kraft Journal Designer, Tammy, loves White and Kraft together, but since that was just a recent challenge, she thought she would share another love of hers which is Kraft with Red and Cream. She started this by taking a piece of red star patterned paper from her stash and distressing the edges. She then added the panel to her Brown Kraft Cover Weight Cardstock. Using Buff Ivory Cardstock, she printed some red gingham papers from Cupcake Cards & Crafts, cutting a small panel and distressed the edges. Next she added a die-cut doily from which she cut out of Lunch Bag Kraft Text Paper to the top and bottom of that panel. 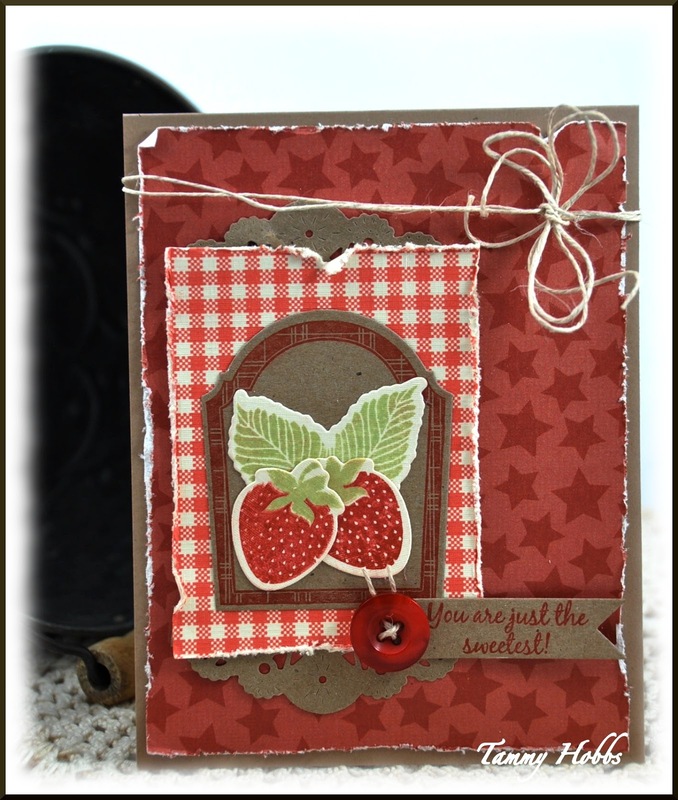 Using stamps and dies from WPlus9, she stamped a frame onto Lunch Bag Kraft Cardstock onto which she added her delicious strawberries which were cut from Buff Ivory Cardstock. A button laced with Natural Hemp Cord was added to the sentiment banner. Lastly, Natural Hemp Cord was wrapped around the top of the card and tied off in a bow. Please visit Tammy's blog, Creating Somewhere Under The Sun, to view additional pictures and information for the card she created today. Today's challenge really WAS a challenge for designer Becky Garrison! As a lover of COLOR, it was hard to choose one color to match with kraft. And then as she was thinking about what to do, she thought about Large Kraft Shipping Tags, and how easily they could be taken from simple and utilitarian to gorgeous, just by using some pretty paper. And that is how she came up with a collection of tags, all using one patterned paper, but highlighting a different color on each. A pretty brocade paper is a good choice because it can be truly elegant. Embellishments can be added in everything from simple to frilly or blingy, and anything in between. On the right side the black has been the focus of the tag, with a black paper flower. The center has yellow ribbon and a paper flower with a yellow button, and on the left hand, some black tulle ribbon and a stack of three buttons with just a touch of red in the center give just a pop of color. Don't be afraid to use any of your favorite colors with Kraft, because they all work! Please stop by Becky's blog Becky Garrison Paper Crafts to get more details on the tags. Like the DT creations. Kraft is so versatile and there are several colors that I like with it. Awesome inspiration from DT thank you for the fun challenge. Great Design Team projects this week, ladies! Thanks for a challenge with a product I neglect! Great inspiration.